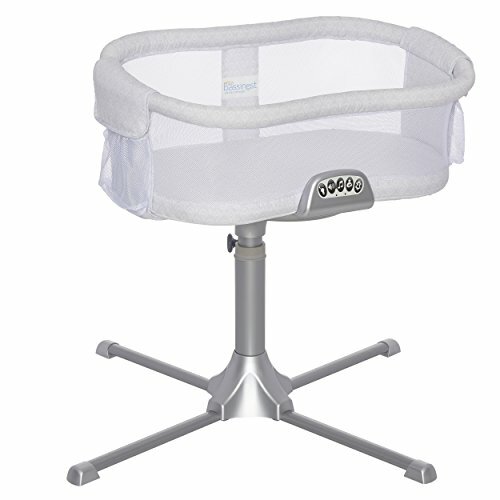 360 degree rotation to keep baby close or get out of bed without disturbing them. Patented side wall lowers and returns automatically (can be locked if desired) for easy tending to baby - Ideal for nursing mothers and mothers recovering from C-sections. Fits most beds from 22"-34" tall. Base tucks easily under bed and requires only 32" clearance from wall. Includes 100% polyester coordinating fitted sheet (machine washable). Includes nightlight, 3 soothing sounds, 3 lullabies, nursing timer, and 2 levels of vibration - All with 30 minute auto shut-off.